← Speaking at Automotive Dealer Subprime Sales Success Workshop on April 7-8th in Atlanta, Georgia. By Greg Johnson. 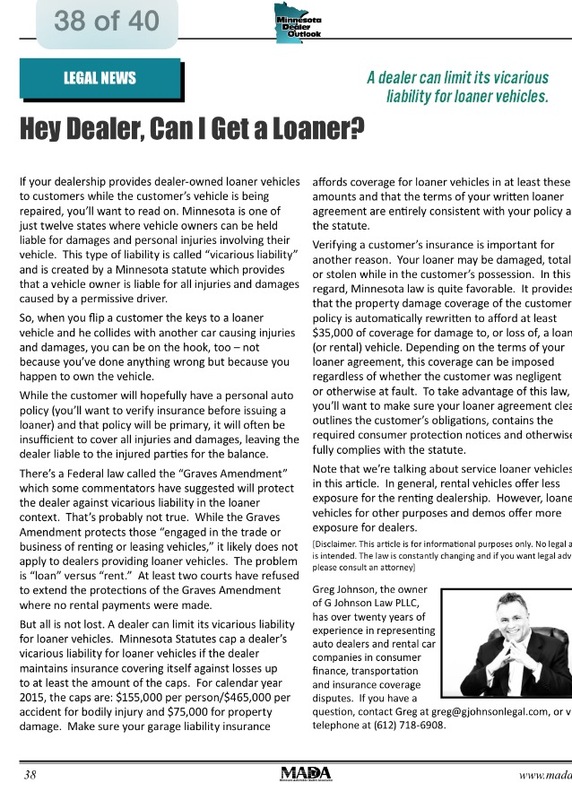 I recently wrote an article for the Minnesota Automobile Dealer Association’s MN Dealer Outlook Magazine (Winter 2015). If your Minnesota dealership provides dealer-owned loaner vehicles to customers while the customer’s vehicle is being repaired, you’ll want to read on. Minnesota is one of just twelve states where vehicle owners can be held liable for damages and personal injuries involving their vehicle. This type of liability is called “vicarious liability” and is created by a Minnesota statute which provides that a vehicle owner is liable for all injuries and damages caused by a permissive driver. So, when you flip a customer the keys to a loaner vehicle and he collides with another car causing injuries and damages, you can be on the hook too – not because you’ve done anything wrong but because you happen to own the vehicle. While the customer will hopefully have a personal auto policy (you’ll want to verify insurance before issuing a loaner) and that policy will be primary, it will often be insufficient to cover all injuries and damages, leaving the dealer liable to the injured parties for the balance. There’s a Federal law called the “Graves Amendment” which some commentators have suggested will protect the dealer against vicarious liability in the loaner context. That’s probably not true. While the Graves Amendment protects those “engaged in the trade or business of renting or leasing vehicles,” it likely does not apply to dealers providing loaner vehicles. The problem is “loan” versus “rent.” At least two courts have refused to extend the protections of the Graves Amendment where no rental payments were made. But all is not lost. A dealer can limit its vicarious liability for loaner vehicles. Minnesota Statutes cap a dealer’s vicarious liability for loaner vehicles if the dealer maintains insurance covering itself against losses up to at least the amount of the caps. For calendar year 2015 the caps are: $155,000 per person/$465,000 per accident for bodily injury and $75,000 for property damage. Make sure your garage liability insurance affords coverage for loaner vehicles in at least these amounts and that the terms of your written loaner agreement are entirely consistent with your policy and the statute. 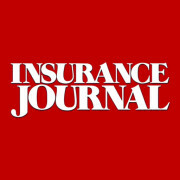 Verifying a customer’s insurance is important for another reason. Your loaner may be damaged, totaled or stolen while in the customer’s possession. In this regard, Minnesota law is quite favorable. It provides that the property damage coverage of the customer’s policy is automatically rewritten to afford at least $35,000 of coverage for damage to, or loss of, a loaner (or rental) vehicle. Depending on the terms of your loaner agreement, this coverage can be imposed regardless of whether the customer was negligent or otherwise at fault. To take advantage of this law, you’ll want to make sure your loaner agreement clearly outlines the customer’s obligations, has the required consumer protection notices and otherwise fully complies with the statute. Note that we’re talking about service loaner vehicles here. In general, rental vehicles offer less exposure for the renting dealership. However, loaner vehicles and demos offer more exposure for dealers. This entry was posted in ADCF Policy, Auto Dealer, Coverage, Rentals and tagged Auto Dealers Coverage, Auto Dealers Operations, Auto Dealerships, Graves Amendment, Rental Car, Rental Car Liability. Bookmark the permalink.